Mayor Catherine Pugh and Gov. Larry Hogan at the Madison Park North apartments demolition Friday. Governor's Office photo. Reality is beginning to set in: The political world has been dramatically altered by Donald Trump’s surprise victory on Nov. 8. Some politicians are adjusting while others are wailing like it’s the end of democracy, organizing pointless protests a full five weeks before Trump even takes office. In Maryland both kinds of politicos – the realists and the hopeless idealists – have been on display recently. Count Gov. 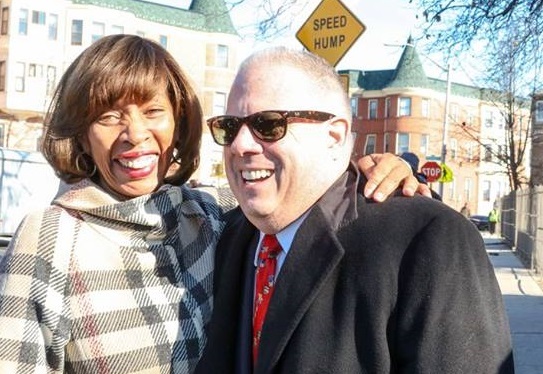 Larry Hogan, Jr. and new Baltimore Mayor Catherine Pugh among the pragmatists. They want to deal with reality on the ground. The governor continues to steer an independent course largely free of ideological rigidity and party obeisance. His words and actions in Baltimore over the past week indicate that Hogan now understands the importance of carving out alliances with like-minded pragmatists such as the new mayor. His gracious words of support at Pugh’s inauguration were followed by a celebratory event in West Baltimore marking a big step forward in attacking the city’s vast vacant-housing problem. Republican Hogan knows he has a quiet supporter in Democrat Pugh and it will be up to him to show her he’s determined to do what he can to uplift Baltimore’s economic development. For her part, Pugh made it clear she’ll be a non-ideological mayor who is interested first and foremost in results. Going to war with the Republican governor isn’t on her agenda – a marked change from the last City Hall occupant. She’s a lifelong networker who now intends to ask for favors and assistance from those in her wide-ranging list of business, political and foundation contacts. Rather than snub the president-elect at Saturday’s Army-Navy game in Baltimore, she warmly met him and handed Trump a letter detailing how the “make America great” president-in-waiting can jump-start the city’s lagging economy with some big-ticket infrastructure projects. She also has expressed the hope that she and Hogan can team up to win over the next president for development programs in Baltimore that create jobs and reduce government dependence. Pugh isn’t being helped, though, by other Baltimore officials. The new City Council, as its first act, voted unanimously to condemn Trump and his intemperate Tweets and verbal assaults. That counter-productive move achieved nothing positive and created a hostile atmosphere for Trump two days before he visited Baltimore. It was a sign that the new City Council will pander to liberal political emotions and do little to help Pugh bridge differences with Republicans soon to be running the country. What the new Baltimore Council members need to keep in mind is that war whoops and fiery denunciations bring nothing in the way of results. The city’s legislature already has a well-earned reputation for incompetence and irrelevance. Sadly, it may get worse. When faced with a staggering crime and drug crisis, intensely imbedded poverty and lack of economic opportunity, what action does the council take on Day One? It alienates the president-elect. Now that’s really going to help address the city’s most pressing needs. The new members of the City Council should step back and reconsider such rash behavior. They should take a cue from outgoing U.S. Sen. Barbara Mikulski, who made a strong call for civility and understanding among politicians of differing stripes in her farewell speech on the floor of the Senate in Washington. Mikulski was a down-the-line liberal Democrat yet she never stopped trying to find common ground with Republicans and conservatives. Getting things accomplished was paramount in her mind. That’s the lesson the eight freshman Baltimore City Council members need to learn. They’re off to a terrible start – and that soon may be compounded by votes to approve a $15 an hour minimum wage that could prove so onerous businesses will quickly flee across the city-county line. Politics, veteran practitioners tell us, is the art of the possible. Hogan, Mikulski and Pugh understand the truism of that expression. Getting bogged down in emotional ideology and name-calling is a sure sign of a weak political hand – and a formula for continuing failure to produce constructive results and progress.